Yes, very nice................. Now, WHEN???? The time between first images and release date of the Zvezda A320 was nearly one year. So lets wait when we will have this beauty on our desk. As I know the first sprues is ready and a decal art in progress. One of my favorite Russian Airliners indeed! Is it just me or is that fin not glued on right? Every bit as wonderful as I hoped for. Bravo Zvezda! How much is the kit? I would like to add a few of these to my stash with numerous decals for. And will we be able to purchase it from a retailer in the USA? If so how soon? For anyone interested, from Bra.Z Models, Cartograf silk-printed Interflug and Cubana old colors decals for Zvezda IL-62 kit. Everything I've seen thus far it looks fantastic. I have a kit on the way from Moscow, so hopefully it will be here in a week or two. From the initial look of it, this could well be the best value-for-money out-of-the box injection-plastic 1/144 airliner kit thus far. It looks like a cracker of a kit, but I'm reserving final judgement until I have a chance to give it a thorough going-over with a fine toothed comb. And I'll warn everyone right here and right now - I *love* the Il-62, so I'm going to point out exactly what I see. If you think I'm being "nitpicky" or a "rivet counter" I'll warn you right now that I am when it comes to the Il-62, and not to read what I'm going to write if it makes your blood pressure go up. Add ROU 880.00 to that kit cost for global shipping and you're up to US$38.55. Still, it's probably the best deal available. I ordered mine from another vendor and I'm paying the PAS cost PLUS shipping..about $10 more. If you are going to buy one box, then yes. About 100 years as I do not buying items one (alone) at a time and this is wholly because of postage costs. Bring it on........ That's just what I want! I rather like the Il-62 myself........ While you're at it, how about giving us your thoughts on the feasibility of making an earlier Kuznetsov powered Il-62 from this kit? If you do find just one thing out of spec on this kit, my guess is the passenger windows may be slightly oversized. I flew a temporary replacement service for the Lot Il-62M fleet in 1987-88 with another -62........ A DC-8-62. How ironic is that? Doing an NK-8 conversion *should* be pretty straightforward. The only substantial change is the engine nacelles. I've already asked Ivo about it, but he claims he's too busy to do the CAD work. He's under the impression that Small Stuff will do it, but the gentleman who does Small Stuff told me he's not that interested since he doesn't think there's a market for it. I disagree (obviously), and I'm going to keep hammering. There are LOTS of cool color schemes for NK-8 powered Il-62s. with international shipping (basic) to the West Coast USA would US$51....A bit steep for my pocket book. Picked the IL-62M kit up today at Telford (one of the very few on sale) and it is a gem. for a total of 5 kits was Euro 14.00.
from them before without any problem. I picked one up drom the aviation megastore yesterday. I couldn't resist and took al major partsof thesprue, assembled the cockpit and h. stabilizer and can only agree with Ray that the kit is a gem. Very fine detail as you can see in the pictures above and the fit is terrific. According to the instructions the cockpit interior must be assembled completely first and then puton the nose wheel bay. There are no locator pins whatsoever on the inside of the fuselage, only two small gaps for the wheel bay. Nevertheless the cockpit fits beautifully in the fuslage halves without leaving any gaps. The only small drawbacks I can find thusfar are the sinkmarks for the locator pins on the fuselage and the cockpit window is a bit wider than it should be. But since it is quite soft plastic it is easily bended in the corrct position when assembled. One slightly off topic question, how can I best assemble the cabin windows if I want to keep them open? What glue to use? Watchmaker's cement is ideal if you can find it. Otherwise, in your part of the world, Humbrol Clearfix. I am considering the NK-8 version, and probably will do it eventually. But first I am planning to do a detailing set for the M version. Glad you liked the Tu-134 sets! So lets wait and see ! Please! Everyone email Eugeny and urge him to do the NK-8 conversion! Many of the really interesting Il-62 schemes are the older NK-8 powered airplanes. 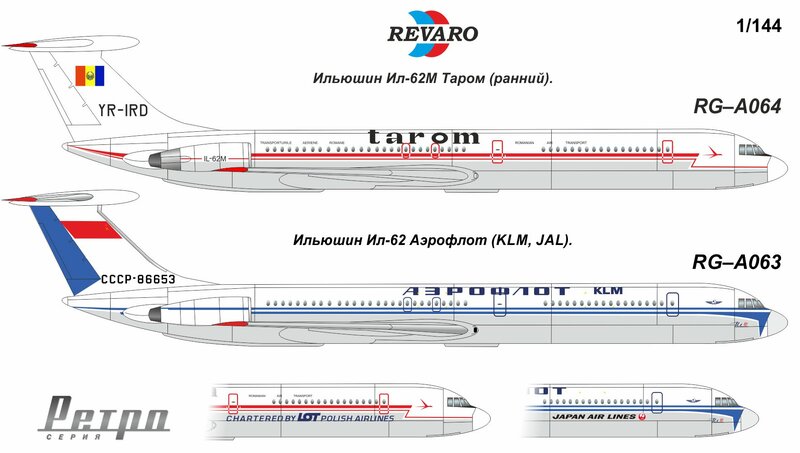 Second that Aeroflot-KLM version (I believe Revaro has that scheme right? ), so I'm in for a NK-8 conversion as well. Thanks for the lead Ruben....I just placed my order with Hobbyland for one kit. As a new customer I received a 5% discount on my first order. Me too. Thanks for that Ruben!